Heat is perhaps the ultimate guy flick. Directed by Michael Mann, the film tells the story of two not-so-very-different men. One, an LAPD homicide detective named Vincent Hanna (Al Pacino), is so consumed by his work that he’s failing his third marriage. Hanna prowls the streets of L.A. like a wolf, stalking those who would do wrong, while his personal life falls into ruin. The other, a professional criminal named McCauley (Robert De Niro), is simply doing what he knows best – armed robbery. He also lives a lonely existence, making no personal connections that he couldn’t walk out on at a moment’s notice. McCauley and his crew are after one last score – a bank heist that could land them more than $12 million. As these two hardened pros go about their business, they gradually become aware of one another – predator and prey – and each begins to gain a certain respect for the other. But both also know that they’re on a collision course: In the end, only one will be left standing. As if the Pacino vs. De Niro match-up weren’t cool enough here, Mann has surrounded these two screen legends with an absolute dream cast of fine supporting players, including Val Kilmer, Jon Voight, Tom Sizemore, Ted Levine, Hank Azaria, Ashley Judd, and Natalie Portman. Each character seems well-rounded and fully-dimensional. The plot itself is based on years of research by Mann into actual criminals and police work, making it both plausible and believable. And when the action heats up, it’s first rate and entirely justified by the story. 20th Century Fox’s new 1080p/2.39:1 aspect ratio Blu-ray presentation, mastered from a brand new 4K scan and restoration supervised by Mann, improves upon Warner’s 2009 Blu-ray image in virtually every way – and the 2009 presentation was good for its day (see our review here). Something that’s obvious right off the bat is that the color timing is much improved; the colors are more richly saturated now and more natural too, yet still have that just slightly desaturated look that’s true to this film. The night sky and shadows are more truly black in some scenes now. Overall image detail exhibits greater refinement, crisp yet clean looking even given the occasional optical softness (the film was shot with anamorphic lenses), and the grain texture is more subtle and refined. This is a very film-like image, with not a hint of digital filtering. I’d love to see how an actual 4K Ultra HD release could improve upon this and it’s too bad there isn’t one. Nevertheless, this is a significant visual upgrade. Whereas the previous Blu-ray offered a 5.1 Dolby TrueHD mix, this new edition has 5.1 DTS-HD Master Audio. The new mix retains the smooth and natural staging of the previous mix, which was by turns lively in action and atmospheric otherwise, and adds a bit more heft. The DTS sounds fuller and more engrossing, which gives the staging a bit more depth. Dialogue is clear and tight. Surround activity is satisfying, with nice room in the mix, and very good LFE reinforcement. The result is a highly immersive audio presentation. It’s not as dynamic as a new genre film 5.1 or 7.1 sound mix, but it’s the perfect mix for this film. A quick note on the film itself: Near as I can tell, this is the same cut that was featured on the Warner Blu-ray release, which was itself only very slightly different than the original theatrical version. It differs from the theatrical version by two tiny edits, removing a couple quick lines of dialogue to smooth the editing flow. The first edit happens around an hour in and removes a tiny portion of Justine’s speech (the words “You sift through the detritus...” are gone). The second edit happens about 13 minutes later, with the removal of a mumbled word by Hank Azaria and Hanna’s odd “Ferocious, aren’t I?” line. Both bits of dialogue felt awkward in the original cut (Who uses the word ‘detritus’ in daily conversation?) and, frankly, the scenes are better without them. The second edit especially is welcome, as now you simply see the reaction on Azaria’s face, which is far more effective in conveying his emotions. Those are the only changes. Let’s put it this way: I’m generally a stickler about keeping alternate versions of my favorite films, but I don’t miss the cut lines here in the slightest. I sincerely doubt most people will even notice the difference. 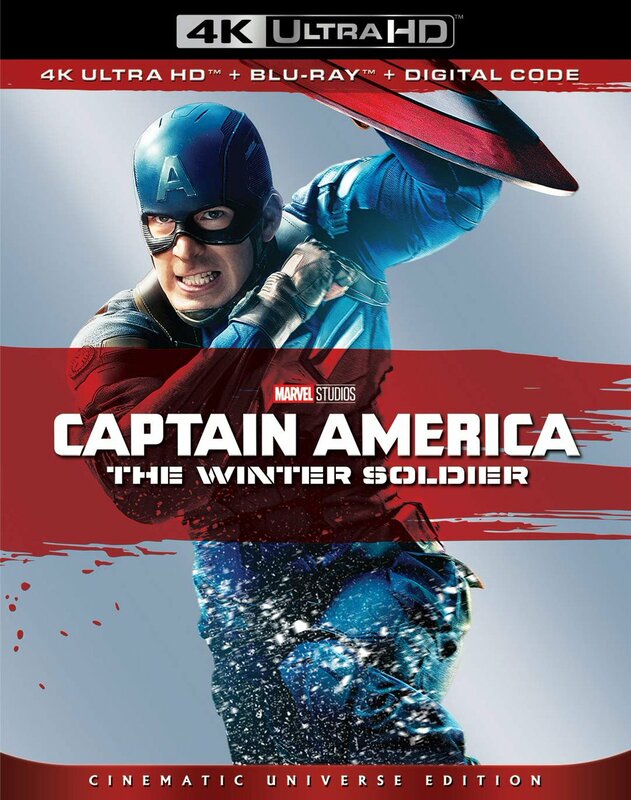 In terms of bonus content, Fox’s new Blu-ray is a 2-disc set. It carries over all of the SD features from the Warner Blu-ray, which were themselves carried over from the earlier DVD edition. Among them are Michael Mann’s excellent audio commentary (now on Disc One with the film), all 11 deleted scenes (9:44 in all), the 3-part The Making of Heat documentary (59:12 – includes True Crime, Crime Stories, and Into the Fire), 2 additional featurettes (Pacino and De Niro: The Conversation – 9:59 and Return to the Scene of the Crime – 12:05), and 3 theatrical trailers. Those are all found on Disc Two, which also adds a pair of new bonus features in full HD. They include a 2016 Academy of Motion Picture Arts and Sciences Panel (hosted by Christopher Nolan and featuring Michael Mann, Al Pacino, Robert De Niro, Val Kilmer, Amy Brenneman, and several others – 63:23) and a 2015 Toronto International Film Festival Q&A (with Mann – 30:27). I wouldn’t want to spoil the joys of watching either, so suffice it to say that both are fascinating and certainly worthy of your time, particularly the Academy panel. This new material doesn’t represent a lot of content, but it’s appreciated nevertheless. There’s also a Digital Copy code on a paper insert. 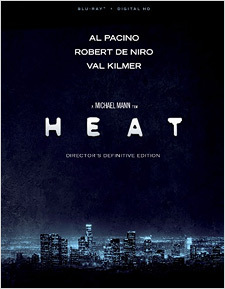 I’ve said it before and it bears repeating: Heat is just a great film that I can’t speak of more highly. I wish this new edition was available in 4K Ultra HD, but even so the restoration is impressive and the hour of added bonus content is a nice treat. If you’ve never seen Heat before, this is absolutely the version you want to buy on Blu-ray. If you’re already a fan and you have the previous edition, my advice is to sell it and upgrade immediately. 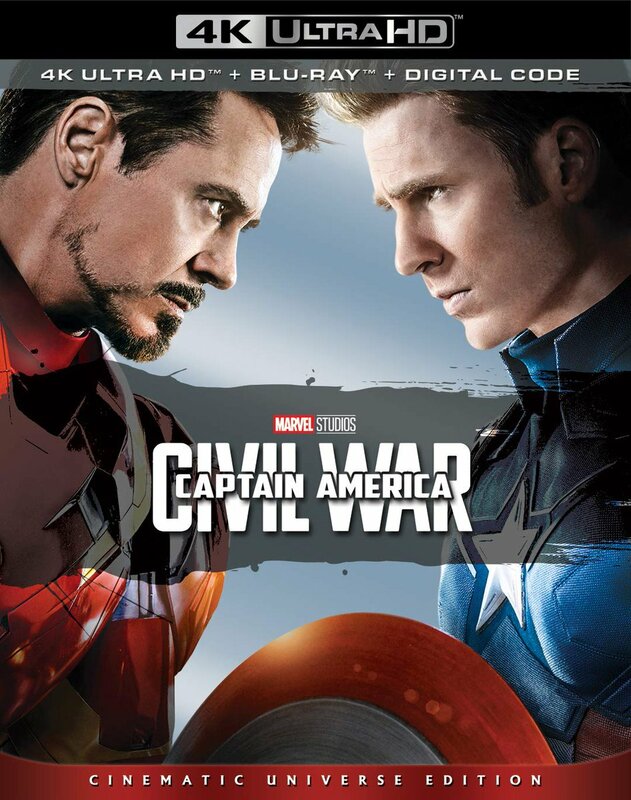 Fox’s new Blu-ray is currently selling for just $8 on Amazon and it’s certainly worth that. Recommended.